The Staffordshire Scorpions took to the floor at the ICE cooler competition at Fenton Manor on the 31st March. "This is the competition we had been building up to all year. We entered six teams into the competition, including four stunt teams, a Pom dance team and a hip hop team." - Staffs Cheer. Coming back undefeated for hip hop with a 1st place to follow their grand champions title last year, they also entered their first Pom dance team and won 1st place trophies for their Level 1, 2 and 3 teams and 2nd place for their stunt group. And not only are they amazing technically, they were recognised as being the team with the most spirit, dedication, politeness and those who were most helpful on the day. They represented Staffordshire University as well as possible and all of this clearly demonstrates the ability of the athletes on this team. "All year round we work so hard to improve our athletes skills, abilities, confidence and to make sure they support each other as a team. The outcome of winning and every single team hitting their routines perfectly is just a massive bonus for the end of this season. Staffordshire Scorpions are ending the year on a high, and will continue to host open sessions for those to come and learn new skills and for new recruits to come and see what it's all about." Every year this group makes people fall in love with cheer and they should be incredibly #ProudToBeStaffs for their efforts. 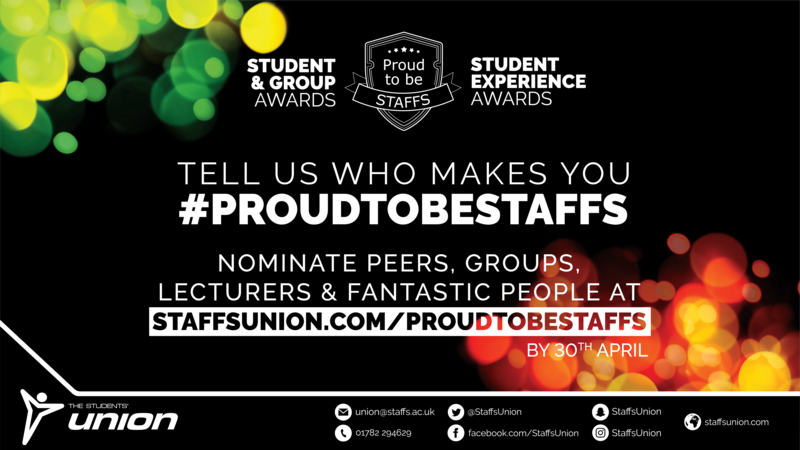 Got a #ProudToBeStaffs story to share with us? Let us know here before April 30th.